Service Policies are subject to change without notice. Please call our office for specific questions. Individuals seeking new or transferred residential electric service may do so at our office located at 103 West Paris Street, Huntingdon, TN 38344. Applicants will be required to provide two forms of identification and complete an application for service with signature. All fees and deposits must be paid prior to processing any service orders. Service orders are processed the next business day. Additional fees apply for same day service. Please click on the Service Policies link for deposit and service fee information. 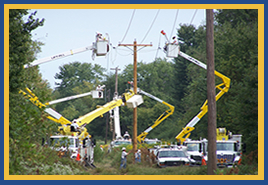 Individuals seeking non-residential electric service may do so at our office located at 103 West Paris Street, Huntingdon, TN 38344. All fees and deposits must be paid prior to processing any service orders. Service orders are processed the next business day. Additional fees apply for same day service. Please click on the Service Policies link for deposit and service fee information.